Yo, bloggers! Whatcha doing next month? 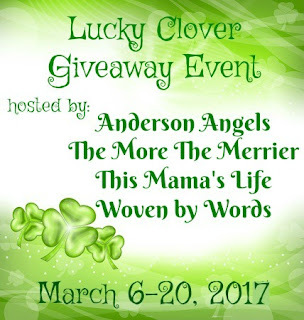 Be sure to sign up for the Lucky Clover Giveaway Event! This will be brought to you by Andersons Angels, This Mamas Life, The More The Merrier & Woven by Words! We are excited to bring you a Fun March Event called Lucky Clover Giveaway Hop. It will run from Monday March 6, 2017 at 12:00pm EST through Monday March 20, 2017 at 11:59pm EST. It's super easy to join in on the fun of getting ready for St Patty's Day! DEADLINE: Sign-ups close on March 1, 2017. Details will be emailed by March 3rd. If you have any questions about the event, we're available to help!